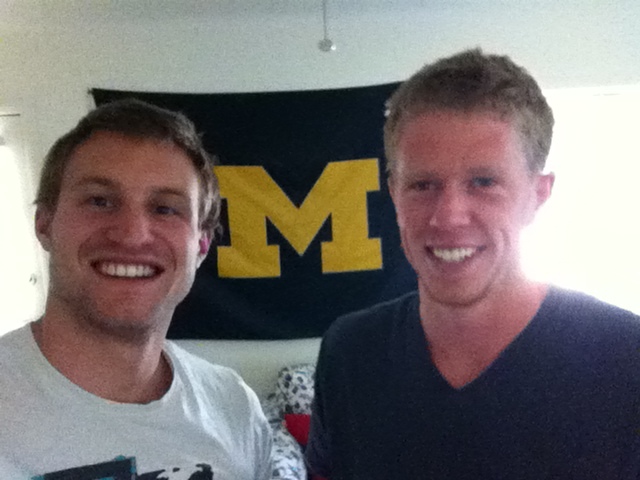 I first met Matt Patton(@_Matt_Patton) and Bobby Savulich(@bobbysavulich @CWeliteSwim @AthleteApproved) in the fall of 2004 on their recruiting trips to the University of Michigan. Both had been to the 2004 Olympic Trials that summer, an impressive feat for any high school student. I think in meeting Peter Vanderkaay, Chris Dejong, Davis Tarwater and the ability to train with a long list of talented swimmers like them as well as Michael Phelps amongst other things, influenced their decisions to swim for Michigan. Plus, my class was really great at recruiting! In the seven years since they first came to Michigan, some things have changed. Matt, a 6’ 3” shockingly white skinned long-armed North Carolinian, transitioned from being a distance swimmer into mainly a 400 and 200 freestyler. Bobby, a 6’2” jacked(muscularly), jammer wearing guy from New Jersey, has moved from mid-distance down to a 100 and 50 freestyler. They have been training for 23 of the last 24 months, 44 of the last 48 months, for the Olympic Team Trials; each has a legitimate chance of turning his lifetime dream into a reality. To give you a glimpse into their world, I went to Ann Arbor for breakfast and to interview them before the big meet at the end of the month. How do you feel about the suits allowed at this year’s trials and Olympics? Matt: I think the suits taught us that body position is so important to swimming fast. They basically taught us how to swim fast. Everyone is beginning to go as fast or even faster with just the jammers. It will be nice not to have the stress of finding a suit that fits, dealing with a suit that might rip, or the energy required to put the suit on. I am glad. It would take me 20 minutes to put those suits on and it was tiring! Matt, share a little bit about how you felt going into the 2008 trials; compare it to how you feel going into these Trials? My feelings before 2008 were simply to swim fast. I knew I did not have a realistic shot in any of my events. The 400 had Vanderkaay, Vendt, Keller, and Jensen – three of the fastest swimmers in American history. I just wanted to go my best times and place as high as I could. This time around, there is a lot more pressure. Seeing myself as a legitimate contender comes with a lot of stress. I think the athlete that controls emotions and saves energy for the race will have a big advantage. In 2008 I felt like I needed a miracle to make the team. Now, I think it is a real tangible thing for me to qualify and to represent the USA in London. Bobby, where are you ranked in the 100 freestyle? Where do you rank yourself? I believe I will be ranked around 10th going into the trials. Since it is a relay event, they will take the top 6. I am not concerning myself with the other swimmers because I cannot control what they do. Matt what about the 400 freestyle? You are ranked where and where do you rank your self? Technically, I think 5th. I try not to rank myself, just do the best I possibly can, day in and day out. Matt, are you thinking about specific times that you want to go, or is this only about getting to the final and getting in the top 6? Racing is the most important aspect of trials. It is about getting second or in the top six for the 200..In training and meets this year, I have been consistently a lot better. However, my shave and taper time has not come yet. So realistically, I want to see very big drops. It has been a few years since I have seen a big drop. I think I am due to surprise myself. It is all about the race! For the 100 free, I think it is all about getting into the final and racing. Once you are in the top 8, the times do not matter. Bobby, can you explain your strategy in the 100 free? It is a controlled sprint. I have a strong background from being a middle-distance swimmer, so that helps tremendously on the second 50. Matt, what about the 400 free? Most importantly, my strategy is to race. I want to put myself in contention to place in the top two. I always like to come home fast. I would like to see a solid first 200 filled with easy speed. A building 3rd 100 and a sprint home in the last 100. What are you going to do differently that you didn’t do the last time you were at trials? I am going to conserve my energy till the gun goes off! I am going to stay calm; I know where everything is, what to expect, what is required out of me. I know what the ready room is like and what walking out in front of so many people feels like. I will try to relax and enjoy it more. Matt, how far would you say you have swum to get to the place you are at, literally in miles? Since being at Michigan at least 15,000 miles. Since starting competitive swimming, around 30,000 miles. I hit around 60,000 – 75,000 yards/meters a week. Bobby does that number sound about right? I was thinking more along the lines of 830,000 miles, but Matt was just studying for the GRE so his arithmetic skills might be sharper than mine. Bobby what’s more different about this meet from all of the others? At this meet there is a lot at stake. Every meet before this is just a stepping stone to these Trials. I have to put together the swim of my life against the best in the country when it counts the most. Well I’ll be watching results, webcasts and TV cheering like crazy for you guys! I know you both can do it! This is one of the first things I see (and correct) for many Breast strokers who come to tweak < the athletic edge >. I have to say, I enjoy seeing it because it’s easy to fix and swimmers immediately are more efficient and they “feel” it. The underlying problem here is surface area, Frontal Surface Area (”FSA”) to be more specific. To really understand what FSA is, imagine that you are standing behind the wall of a pool that people push off and turn on. Instead of the wall being tile or concrete it’s glass. Looking through the glass you can see under the water, straight down the lane to the opposite cross. When an object (a swimmer for instance) is moving towards you, what you see coming at you as you stare down the lane is the objects FSA. You are concerned about only what goes on under the water (air is about 900 times less dense than water and therefore it can’t slow objects down like water can). It is ideal for the object traveling through the water to project the smallest frontal surface area possible under the water, thus allowing for minimal drag production. In other words, you shouldn’t see a lot of swimmer as they approach you. 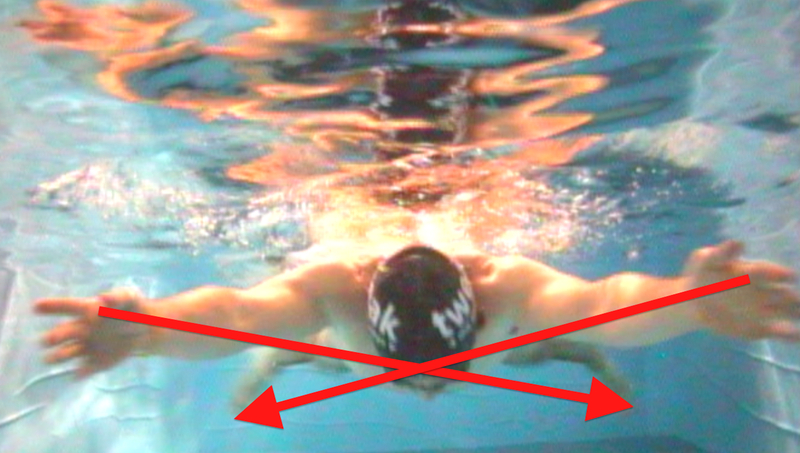 The picture above shows you an example of a swimmer projecting a large FSA (we see a lot of the swimmer). The Breast stroker here has started to pull before finishing their kick, potentially shorting proper extension or skipping it entirely. Because of this mistake, we are able to draw two diagonal red lines, one from the left foot to the right hand, and one from the right foot to the left hand. These lines make an X, an Evil, Evil, X. When watching proper Breast stroke, we should never see this. 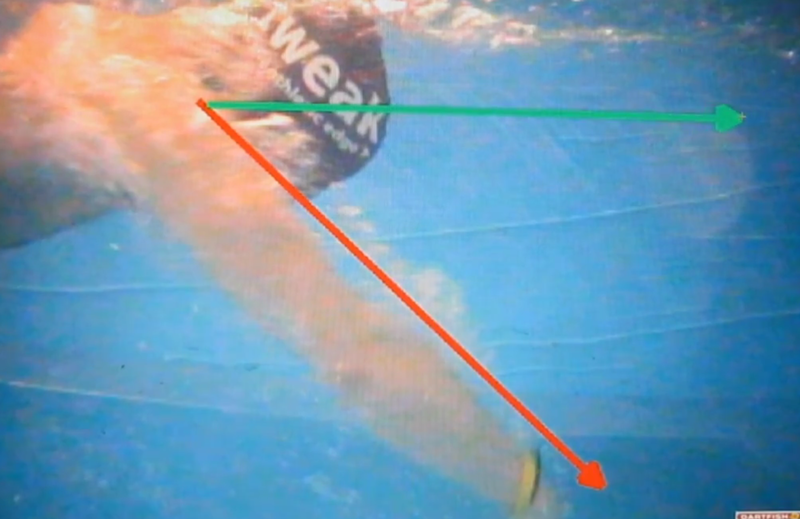 In Breast stroke, starting to pull before the kick has finished is a big problem because the kick generates more propulsion through the water than the arms do, a great deal more actually. Starting to pull (spreading the hands apart) before this propulsionary process is complete is like opening a parachute in mid-air; you slow down FAST! To get the most out of the kick, we want our arms and body to be in a position that projects a small FSA; therefore, we need to achieve a more streamline body position. I don’t think swimmers actually need to be in the “streamline” position; however, they should get close to it. A good start to fixing this problem is to simply tell the swimmer to wait until they have finished the kick (feel their feet come together) before initiating the pull (letting their hands come apart), Two Kicks-One Pull and 3-Second Glide drill are great ways to practice and get a “feel” for the proper technique. Like most problems relating to FSA, lengthening out the stroke is key. What do you think of our new site??? We want to thank Josh Eberly of RunSleepDesign.com for all the incredible work he did and we want to especially thank him for his patience! We hope that all of you like it too! We wanted it to be simple, informational and pretty. Y’all getting that kinda feel? In addition to the new site we are starting this Blog and there are going to be a few changes happening around the shop over the next few months. Athletes using tweak are getting faster and as they improve we must keep improving with them. With the addition of our new coaches we’ve increased our collective knowledge base further than ever before and we are excited for an unparalleled summer at the shop. This Blog is a way for us to tell you stuff like that and to extend the incredible teaching that goes on at tweak < the athletic edge >. By the way, I’m Johnny Austermann and I’m the manager at tweak. While the Blog has my name attached to it we will definitely be having posts from other individuals and athletes. Read our first post: Orientation, Orientation, Orientation!